The final stage of Kent's high speed rail link is in place with the opening of Ebbsfleet International Station. 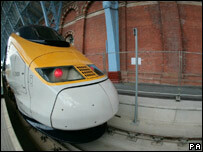 The first Eurostar train for Paris left the £100m station at 0538 GMT. Seven services to Paris and five to Brussels will run from the station, increasing the number of trains serving Kent from 12 to 16 trains every day. But it means a change for Ashford's international station, which opened 11 years ago, with fewer trains leaving for Paris and none going to Brussels. Richard Brown, chief executive of Eurostar, said there were 159 passengers on the first train out of Ebbsfleet on the new £5.8bn Channel Tunnel rail link, which is now known as High Speed 1. "It's really exciting to see the station opening to its very first passengers," he said. 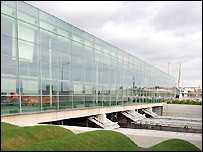 Ebbsfleet is situated in north Kent, close to junction two of the M25. Mr Brown said he expected there would be a significant increase in passengers using the Eurostar services now that Kent had two international stations running into St Pancras, in London. Ashford International has retained three daily services to Paris and a daily service to Disneyland Resort Paris as well as its weekly services to Avignon during the summer and the French Alps during the winter. Travellers wanting to travel to Brussels from Ashford will have to change at Lille. A 14,000-name petition against the cuts to Ashford's Eurostar services was handed into the government in July. One regular passenger to Brussels said her journey from Ashford would now take up to three hours longer. Edith Robson said she would now have to travel to London in order to get another train to Dartford, and a Fastrack bus to Ebbsfleet. She and her husband, who also works in Brussels, moved to Ashford 19 years ago. "From what Eurostar has said, we are convinced that Ashford actually pays its way, but they're taking seven out of 11 of our trains. "What's that going to do to us if it's not going to decimate us?" she asked. Damian Green, the Conservative MP for Ashford, added that while Monday was a day of celebration for Ebbsfleet, it was not for Ashford. "Ashford is a fast-growing town. The rest of east Kent is fast-growing as well. Ashford is easy to get to by train in a way that Ebbsfleet isn't." Eurostar has maintained that Ebbsfleet is equally or more convenient for most people. However, it announced on Monday that it is to spend a further £750,000 on improving facilities at Ashford International.